Maine’s first council was located in Portland. Council #101 was instituted on August 12, 1894. Five hundred Knights from Massachusetts, Conneticut and Rhode Island chartered the special ship “City of Portland” and travelled from Boston Harbor to Portland to participate. The ceremony was held in City Hall under the direction of State Deputy James F. Hayes of Massachusetts, assisted by a staff from Lowell and Bunker Hill Councils. 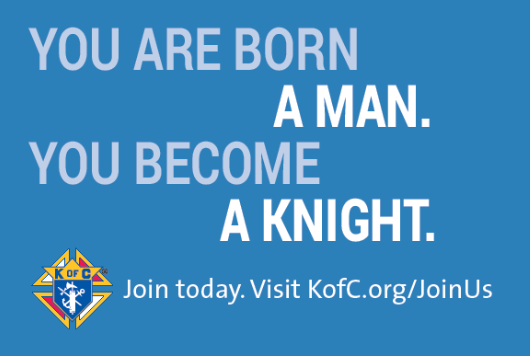 Started by a humble parish priest the Knights of Columbus have grown into the world’s largest lay Catholic organization with over 1.8 million members. A household name for many, there’s still a lot of mystery that surrounds these noble men. The explanation of the Knights of Columbus Fourth Degree Emblem per Supreme Council Form1910. When asked to consider the position of State Historian by the newly elected State Deputy, Phil Lizotte, I had some severe misgivings. I have heard of recent individuals who have held this title and without any results. At first I was told to sit on the State files and collect all records. This process took several months and finally a truck with Joe Presti showed up at my home and a file cabinet and some boxes of files were delivered. These files came from Rachel Milheron and represented most of the past records. A call from council 106 in Lewiston made additional files from the last Historian of record, Arthur J. Roy. Arthur Roy was the State Historian from 1976 to 1987. I’m sure we had other Historians but can find no list of their appointments. We owe a great deal of appreciation for Arthur and his predecessors for keeping and organizing the old records of the Maine State Council. My challenge was to start with years of old files and determine what is relevant and what is useless from a state level. I have only begun to examine all that I have and now find it possibly an appropriate time to report my findings. The History of the Maine State Council chapters I have started to write for our State Newsletter will be an ongoing project that will last for quite a few years. At first I will tell the story as prepared by earlier State Historians. We have a reasonable documentation of the earliest years of organization in Maine. Once we begin to reach more current state and council information I will need to outreach to our older members for their assistance. I have asked the Past State Deputies currently alive to send me their bio’s for future use. We have had some results and we hope more will find the time to send us their history as of the time they were installed as new State Deputy.